Every single day this week we have been enjoying the fruit of our labor…literally. I love strawberry picking season, but this year, I didn’t pick enough – only three pathetic gallons. We just finished the last of our fresh berries today, and I am already mourning their loss. 1. Make a pie crust from scratch or use a good ole’ store bought variety…bake accordingly, and then let the crust cool. 2. Soften an 8 ounce package of Cream cheese, and spread across bottom of the crust. 3. You will need 1 1/2 quarts (6 cups…I checked 😉 of fresh berries (but we used a bit more). 5. Take the remaining three cups of strawberries and mash. 6. Mix the strawberries with 1 1/2 cups of sugar and 4 TBS flour till thick. Heat over the stove and bring mixture to a soft boil, stirring constantly for ten minutes so it doesn’t burn. Let mixture cool. This is what is will look like – yum! I could have just eaten this all day. 8. Pour mixture into pie crust and it’s ready to be devoured. My precious nieces were trying to help me make this more “presentational”. They added the “flower” – Southern Living at its finest. Can you tell we were eating by our ambiance lighting? We were celebrating my sweet niece’s graduation from high school. She was home schooled all the way through and will now be entering nursing school in the fall. She is a true sweetheart and total servant. I can guarantee that there will be a few people who will not want to check out of the hospital when she is their nurse. And when you have an extended family this large, there are always birthdays going on at the harried homestead. We threw in a special happy birthday dirt cake as well. (My sweet daughter and nephew). Wow Jen, that looks delicious! Great pictures, and great use of fresh strawberries. Love it! The kids and I polished off two pints of strawberries in two nights. 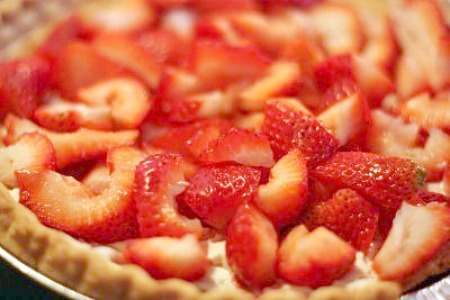 Now I need more strawberries to make this pie! The strawberries in our garden are just starting to come in. This looks so delicious that I can't wait to make it! We're not -quite- into strawberry season here yet, but I am saving this and will CERTAINLY be making it in two or three weeks! I love it that it doesn't take gel! Looks yumalicious! Lordy. You domestic people are killing me. Yum! The pie looks great! The only strawberries we have are from the supermarket, but we're still enjoying them. 🙂 I'm planning to make a berry tart, with strawberries, blueberries, and raspberries. My best friend loves strawberry pie. I will be sending her over for a slice, oops I mean to check out the recipe. Looks like we both had strawberries on our minds, Jen! 😉 Yours looks fabulous…I wish I had a photo of mine. Have a wonderful day! Quick question regarding the pie- did you mix the cooked strawberries with whipped cream and then spread it on top? Or did you spread the cooked strawberries and then serve the pie with the whipped cream? I'm guessing the latter from the photos but I just wanted to be sure. Looks divine!!! This is our first year for our strawberry patch and we've been getting maybe four strawberries per day. Not exactly enough to make your to-die-for pie! LOL! 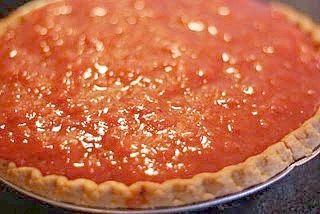 Oh, I love strawberry pie & just cut one recipe out of our local newspaper. My mom used to make one just like Shoney's & we all loved it. YUMMMM! We are growing blueberries & actually have some on our little bushes already. We are SO excited to get our own fresh fruit. Looks like a wonderful time with your family! I love strawberry pie and yours looks so good. I have a recipe like Shoney's and love it but I think I am going to have to try yours. Your redneck freezer!!! I love it. You, my dear, could never be considered a redneck. I love strawberries and even better in a pie with whipped cream! Thanks for the recipe! This looks yummy! I am not a fan of the gel, and have never liked strawberry pie for that reason, but I will have to try this! You have an amazing family! Yum, that looks really delicious. Your niece is beautiful! Looks like you had a fun evening. It hit me this morning that I forgot to add your link to my post last night (it was way past my bedtime! ), but I've had my coffee, my brain kicked in, and I've done it now! I hope everyone will jump in tomorrow for Real Food Wednesday! OMG, I know your fam had to enjoy that! YUM – that sounds wonderful!! I linked up a recipe from my healthy blog today (a yummy idea to use for watermelon). Mmm! That looks really yummy Jen!! ooooh! Or chocolate cream cheese! I am on a newly committed weight loss goal, and just can't get chocolate off my mind. This looks so delicious ~ I'll be trying it soon! I enjoy browsing through all of the recipes & your site. Thanks for taking the time to do this! No link, but, man, that pie looks sooooooo good! I want to try that one soon. I loooove strawberries. Hmmm…I wonder if it would work with blueberries? I have lots of those and I'm about to get more! This sounds delicious! You have such a lovely family. Congrats on the graduate and the birthday! I love fresh strawberries, but gelatinous strawberry pie has never appealed to me. Thank you so much for publishing this recipe. And thank you for including the fact that you also had a birthday cake at your celebration. It's such a treat to see glimpses into your real life. Your family is beautiful. Hope you don't mind, I linked to your bulk cooking post today. Hope you're having a great summer. I'm going to try that Strawberry Cheesecake Trifle for our pool party this weekend. I hope you don't mind, I linked to your bulk cooking post today. Hope you're having a good summer. I'm using your Strawberry Cheesecake Trifle recipe four our pool party…looks yummo.